When Steven Lee Olsen’s major label album wasn’t released, it was the beginning of what he calls the “best, saddest story ever.” But the unexpected ending was triumphant, when his idol Keith Urban turned Olsen’s song “Blue Ain’t Your Color” into a massive hit. Co-written by Olsen, Hillary Lindsey and Clint Lagerberg, “Blue Ain’t Your Color” was voted Song of the Year at the recent MusicRow Awards. Here’s what Olsen had to say about the win. 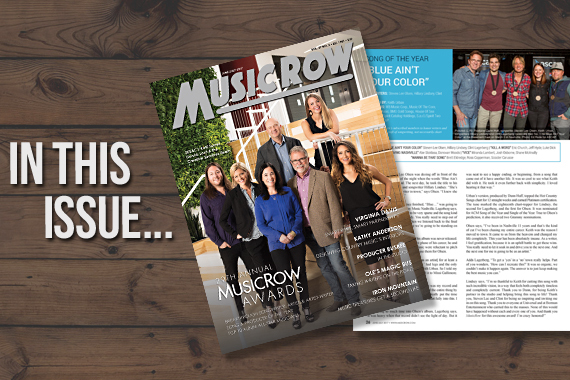 Read more in the new issue of MusicRow magazine or subscribe today. MusicRow: You’ve said that Keith Urban is the reason you moved to Nashville. When did you finally get to meet him? Steven Lee Olsen: I met Keith after “Blue…” was already a single on the radio. One day he asked to write with Ross Copperman and myself. I was pretty nervous but he was the most graceful, talented dude I’ve ever met. Everything you want your idol to be. We went to lunch and he drove us around—I think we were in a Rolls-Royce—showing us where he used to live, where he came from nothing, and he became a real human to me. And then we ate at The Smiling Elephant where he’d been going for 10 years. It showed me to stick it out and gave me a second wind [as an artist and writer]. Whatever Keith does, he does from the heart. He needs to feel the song, feel the lyrics. It was cool to see that up-close. Since then we’ve become good friends. It was bittersweet to let “Blue…” go, but there’s no one in the world that could’ve done what Keith did. He gave it listeners and it was the most successful song of his career. It blows my mind that I was able to be a small part of it. I even got to sing “Blue…” with him at the No. 1 party. A hit like this has been a long time in the making for you. It came to us from the heavens and changed my life completely. I’ve been in Nashville 11 years. This year has been absolutely insane. It took me to the Grammys and I was able to take my mom. And also to the ACMs too and now the MusicRow Awards. It’s been a whirlwind. I don’t know how I’m going to top this year. As a writer, I feel gratification because it is an uphill battle to get these wins. You really need to let it soak in and drive you to the next one. And the next one for me is going to be as an artist. What’s next for your artist career? “Blue…” represents the direction I was going as an artist—a classic r&b throwback sound. After the Columbia deal fell apart, we didn’t get to keep the record. That’s okay because I’m writing much better songs that fit me as an artist and my voice—where I want to sit in country music. I’m building the right team of people and dabbling with producers and trying to find the right fit. I’m writing as much as I can. You’ll love a song that you write, and you listen to it a 100 times and say, “This is definitely going on the record.” Then you keep writing and you beat that. And then you have 20 songs that you absolutely love, but you feel like you are still growing and evolving into the artist that you are going to be. I’m really excited and I’ve never had more fun writing for a project—ever.